Arctic Science on a Roll? Sometimes thinking outside the box means thinking inside the sphere. At least that’s what the designers at New York City’s Studio les bêtes did in coming up with the concept for the Arctic Drifter, an enormous inflatable ball that can hold a crew inside and roll around the Arctic collecting data. The Arctic Drifter’s exterior would be made of inflatable Hypalon airbags — a material similar to that used in rugged inflatable boats — so it could roam across ice, water or flat land in all sorts of weather. When fully inflated, the contraption would be 15 meters (50 feet) in diameter. An inner sphere that remains permanently upright would house a crew, electronics and, as the company’s website notes, a composting toilet. 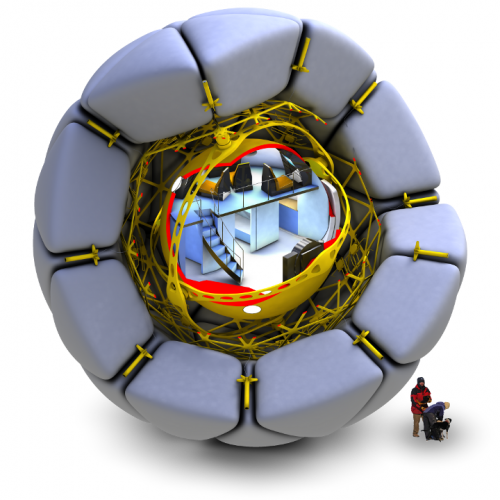 The outside of the ball would be decked out with a network of visual sensors that would project the external environment onto the inner sphere’s walls in real time for the crew to see and navigate.